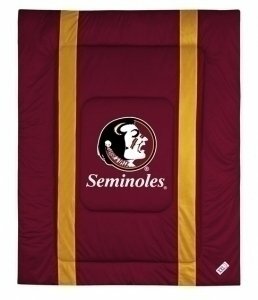 NCAA Florida St Seminoles side-lines comforter KING Florida St , comforter KING 102" x 88". covers are 100% polyester jersey top and bottom side, filled with 100% polyester batting. Logos are screen printed. Machine washable in warm water, and tumble dry on low heat. Made in USA. Comforter KING 102" x 88"
If you have any questions about this product by Sports Coverage, contact us by completing and submitting the form below. If you are looking for a specif part number, please include it with your message. Michigan State Spartans 8 Pc QUEEN Comforter Set - Locker Room Series - Entire Set Includes: (1 Comforter, 1 Flat Sheet, 1 Fitted Sheet, 2 Pillow Cases, 2 Shams, 1 Bedskirt) SAVE BIG ON BUNDLING! Iowa Hawkeyes KING Size 14 Pc Bedding Set (Comforter, Sheet Set, 2 Pillow Cases, 2 Shams, Bedskirt, Valance/Drape Set & Matching Wall Hanging) - SAVE BIG ON BUNDLING! Kansas Jayhawks KING Size 14 Pc Bedding Set (Comforter, Sheet Set, 2 Pillow Cases, 2 Shams, Bedskirt, Valance/Drape Set & Matching Wall Hanging) - SAVE BIG ON BUNDLING!